With a traditional classic look of a pilsner, the personalized Hourglass Pilsner is the recommended choice among many who want a pilsner with a larger engravable area. This is due to the glass having an hourglass type of curve in the glass. The engraved Hourglass Pilsner is 6.5 inches tall and holds 15 ounces. Personalization, text and/or design, on the front of the beer glass is free, other options are available for an additional fee. We suggest keeping your text (if any) to 4 lines of 18 characters per line, it is okay to go over, it may just be smaller to fit it on the glass. 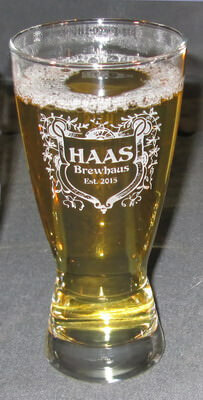 This Hourglass Pilsner is also available in the Hourglass Pilsner and Beer Pitcher Set.